It is a fascinating place, set at an altitude of 1200m and with quiet an impressive view. In the area there are traditional old guest houses. It is the highest peak in Pelion. 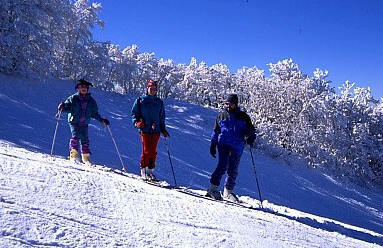 It runs all the year round providing winter sports facilities such as skiing. 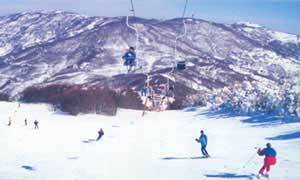 An excellent skiing centre approximately 500 m higher provides lively winter entertainment. 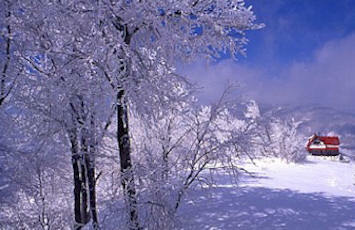 There are two comfortable shelters, two electric ski - lifts, a snow plough and spacious parking. The available snow fields are: 1) Panorama, 1045m length, 300m altitude. 2) Thetis, 350m length, 217m altitude. 3) Iason, 1030m length, 337m altitude. 4) Kentavros, ( Field of great endurance) 5km length. Hania is famous for its dry wine and the traditional spentzofai dish.